A 1 year, study program, with the option of a 2nd year Developing a professional art practice. The study year will consist of 3 x 3-day workshops, followed by a period of directed and independent study in which you will be expected to develop a series of samples/project. Your independent study will be supported by a mid-session feedback day/tutorial day when students come together to share their creative experiences, discuss development ideas and trouble shoot technical problems with the support of the tutor. The focus in year 1 will be on developing your personal creative journey at the same time as developing good weaving practice and refining your technical tapestry skills. You will be expected develop a practice based on in depth research, in both visual and written materials and engage with contemporary art through exhibitions and studio visits. On successful completion of year 1 there will be an option to study for a further year where we will go on to explore a more experimental approach to tapestry, using unusual materials, 3-dimensional weaving and a mixed medial approach. As part of your professional practice, we will explore collaborative projects and consider the challenges of working to commission. Consider the importance of artists paper work – statements, C.V., recording and documenting your works as well as organising and submitting work for exhibition. After completing 2 years of study students will be encouraged to put it all in to practice and organize a final exhibition or event. This course is aimed at creative practitioners (weavers, painters, sculptors or designers) with some experience of tapestry weaving or students who have a have attended a beginners or introduction to tapestry course, with me or other artist/organizations. There is no written/essay element to this course, but students will be expected to document their research on chosen subject, contemporary artists and exhibitions, as a way of reflecting on their practice. On completion of this course there is no qualification, but I am happy to provide letters of reference/student report. The course will provide students with 72 hours of studio teaching. To gain maximum benefit from the workshops students need to be fully committed to further personal development by supporting this study with at least 1 day a week of directed and independent study. Internationally recognised professional tapestry artist Fiona Hutchison has been weaving and teaching for over 30 years. Graduating from the tapestry department, Edinburgh College of Art in 1985, she exhibits regularly in the UK, Europe. As well as teaching many independent workshops and mentoring emerging artists she also teaches tapestry weaving and stitched textiles at Edinburgh University, Dovecot studio and in her own studio. October 31st – 2nd November 2018. Workshop 1 Approaching tapestry. Feedback day/tutorial. 7th December 2018. Workshop 1. Approaching tapestry. October 31st – 2nd November 2018. The aim of this first workshop is to find your own creative voice and style of weaving. We will begin by re-visit the basics of weaving. There are very many approaches and styles to weaving tapestry, depending on where you learned to weave and who taught you. There is no right or wrong way to weave, it is about developing your own personal creative voice. Variations in the type of loom, size and setting of warps, weft materials and experimental techniques, all need to be explored to find your own personal style of tapestry. By studying contemporary tapestry from across the world we will explore a range of approaches to the basic tapestry techniques, experimenting with a variety of weaving materials to investigate different qualities and surfaces that can be achieved in tapestry. As well as developing your own personal weaving style we will begin to explore a range of methodologies to design development. 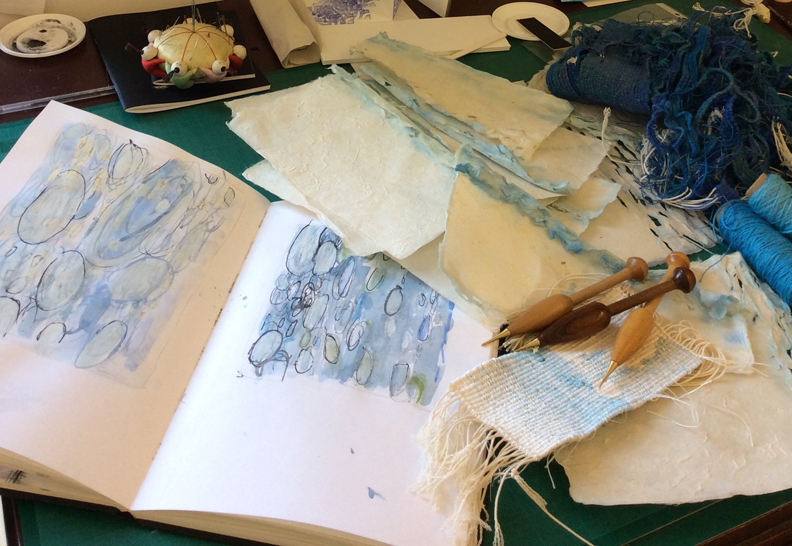 You will be encouraged to build a body of research through drawing, photography and sketchbooks, which will inform your personal creative language and provide you with a source of inspiration for your weaving. Feedback day/tutorial. 14th December 2018. Your independent study will be supported by a mid-session feedback day/tutorial day when students come together to share their creative experiences, discuss development ideas and trouble shoot technical problems with the support of the tutor. Workshop 2. Translation – from design to weave. January. 9th – 11th 2019. In this second workshop we will consider how to translate your ideas into tapestry. You may not have a finalised design, but you will have a body of research/sketchbook from which to take your inspiration for woven projects. At this stage we bring together the visual research (ideas, drawing, designs etc.) and the technical weaving research (woven samples, techniques, warp set, materials etc.) to explore your design marks, colours and surfaces in weave. Sampling is an important exercise in helping you make decisions on what and how to weave your design. In moving from design to weaving there are many things to consider. The most important consideration is why should we translate a drawing, painting or design in to Tapestry. Workshop 3 The final project. 10th – 12th April 2019. In this final workshop we will review the body of work that you have produced. Looking at your journey from idea and inspiration, through your samples and experiments in weave to the final design. What choices have you made? How have you resolve and refined your ideas? In planning your final project there will be an opportunity to discuss your ideas, address any design or technical tapestry issues.. Final presentation – visible warps or turn backs, frames or free hanging. By the end of this 3rd workshop you will have a greater understanding of the creative process that will take you from inspiration through the design to finished tapestry. Having researched, sampled, and planned your tapestry you will now be able to enjoy the weaving process and produce a final work. In this final feedback session, you will have the opportunity to present your final tapestry project. Sharing your creative journey with fellow students we will discuss how your work can continue to evolve and progress in future projects. Please contact me for more information and booking form.